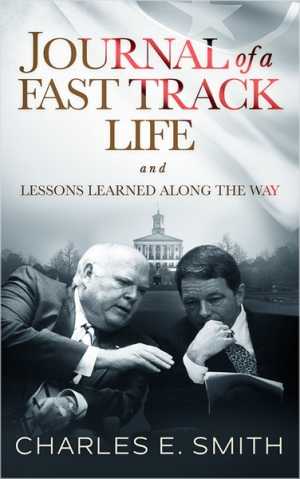 Journal of a Fast Track Life pulls practical reflections from its author’s long and successful career. Charles E. Smith’s career-centered memoir Journal of a Fast Track Life is about moving up in journalism and educational leadership. Structured in roughly chronological order, the book begins by praising Smith’s family’s commitment to his childhood education. It moves on to cover his many years as a newspaper editor, and then as a chancellor and administrator of colleges and universities in Tennessee. Each chapter is organized around a life lesson connected to Smith’s career experiences. He discusses his own mistakes, the mistakes he witnessed in other powerful leaders, and the ways he applied these lessons to future situations. Smith’s prose is varied and precise, offering the exact details needed to understand the newspaper business and the government administration of public universities. He includes fascinating details about how powerful people (“kingmakers”) choose who comes into and moves out of governmental positions. Smith’s insights about making decisive actions and showing a willingness to compromise are backed with substantial but succinct examples. The book’s tone is professional but not overly serious; it effectively employs disbelief and amusement to ground Smith’s tale of a meteoric ascent to the echelons of power. The text can be both self-effacing and braggy; Smith’s career includes examples to follow as well as pitfalls to avoid. While most of the book is personal and specific, the life lessons make it accessible and instructive to those considering their own careers, even in different fields. The book’s strongest sections are those that reflect on working with others. Smith addresses the psychology of leadership, and avoids treating everything as a product of rational decision-making. He critiques behaviors rather than people, and maintains a positive tone. Lessons like “pick fights carefully” and “know thy culture” are backed up with evidence that a nuanced approach to leadership is valuable. Despite relying on some well-worn notions, such as that “true friends are hard to find in politics,” most of the book’s lessons are either unique or illuminate standard phrases with fresh examples. A section of photographs puts faces to many of the recurring figures in the book, though this is ultimately unnecessary. The book’s design is clean and clear. An insightful vocational memoir, Journal of a Fast Track Life evades self-congratulation in favor of collecting practical reflections. Its advice will be useful to those experiencing major shifts in their working lives.